Contents: Part I:Rethinking Our Conceptual Models. E. Aerts, Bringing the Institution Back In. A. Skolnick, Changes of Heart: Family Dynamics in Historical Perspective. D.A. Hansen, The Child in Family and School: Agency and the Workings of Time. L.M. Burton, C.B. Stack, Conscripting Kin: Reflections on Family, Generation, and Culture. G.A. De Vos, A Cross-Cultural Perspective: The Japanese Family as a Unit in Moral Socialization. P.S. Fass, Perspectives on Family Theory: Families in History and Beyond. A. Lawson, Perspectives on Family Theory: New Myths From Old. Part II:Rethinking Research on Nuclear Families. P.A. Cowan, C.P. Cowan, P.K. Kerig, Mothers, Fathers, Sons, and Daughters: Gender Differences in Family Formation and Parenting Style. J.R. Johnston, Family Transitions and Children's Functioning: The Case of Parental Conflict and Divorce. G.E. 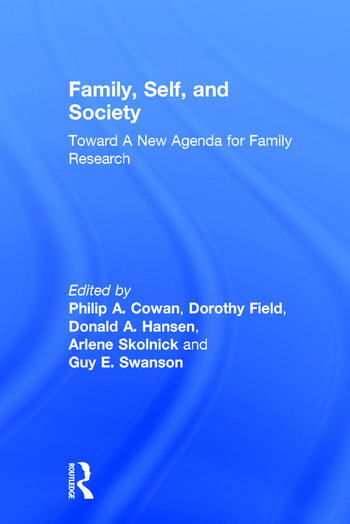 Swanson, The Structuring of Family Decision-Making: Personal and Societal Sources and Some Consequences for Children. M.J. Moorehouse, Work and Family Dynamics. S. Crockenberg, Perspectives on Research in the Early Years of Family Life: Costs and Benefits of Nontraditional Variations. Part III:Rethinking Research on Family Networks in Middle and Old Age. R. McCaslin, An Intergenerational Family Congruence Model. C.L. Johnson, The Prolongation of Life and the Extension of Family Relationships: The Families of the Oldest Old. D. Field, M. Minkler, The Importance of Family in Advanced Old Age: The Family is "Forever." L. Carstensen, Perspective on Research With Older Families: Contributions of Older Adults to Families and to Family Theory. Part IV:Case Studies: Their Role in Theory and Research. C.F. Settlage, D.H. Silver, J. Afterman, K. Hart, K. Nelson, Developmental Process: Mother-Child and Father-Child Interaction During the Second Year of Life. I.S. Bradburn, J.A. Kaplan, Continuity and Change in the Transition to Parenthood: A Tale of Two Families. J.A. Clausen, The Life and Family of Karl Schulz. N.J. Chodorow, Perspectives on the Use of Case Studies: All it Takes is One. Part V:Toward a New Agenda for Family Research. P.A. Cowan, D.A. Hansen, G.E. Swanson, D. Field, A. Skolnick, Issues in Defining a Research Agenda for the 1990s. "...the volume is ambitious....offers some interesting and certainly wide-ranging perspectives on family research..."
"...contains a wealth of thought-provoking theoretical notions and empirical findings."